- Processor: Architecture generalization works too, for example, an Am5x86 is pretty much sped up 486 architecture, etc. - RAM: Just amount estimates are fine, though RAM type and speed estimates are also welcome. - Physical media: Things such as floppy drives, CD drives, and also ZIP drive devices. - Graphics: This covers almost any sort of graphics you can think of, even 2D accelerators. (I actually have a PCI Trident TGUI9440-1 GUI accelerator, from circa 1994, just to give you an idea of how low things can go) This also encompasses things like dedicated 3D cards, 2D cards, and full-on GPUs (like the GeForce 256, or the Riva 128). Thanks! 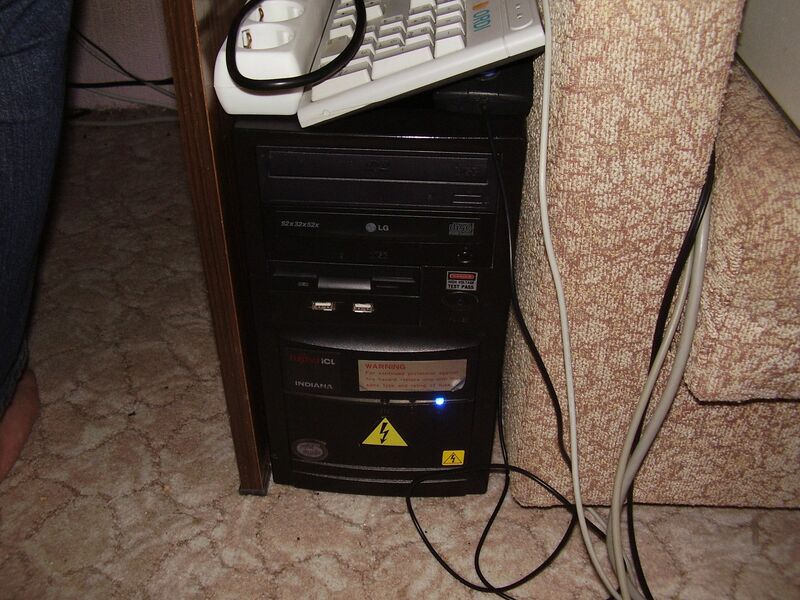 If anyone wants to know, I'm trying to get a better view of what to do with the Pentium III machine I have, which I've mostly come onto here to try and help fix problems for. I will also post pictures of it eventually, if anyone wants. And a SCSI chain with card, CDROM, burner in 2000 for like 1500frs. Cost about 8000 markkas. I'd consider it mid-end. HDD: Definately a Quantum but I'm not sure about size: 5 to 10 GB? HDD: Definately two Quantums but I'm not sure about size: 5 to 10 GB? Last edited by tayyare on 2018-10-18 @ 10:16, edited 1 time in total. Let's think... I worked at Packard Bell's technical support for UK/IE in 2000-2001 and this period was in active support then. ATX motherboard with integrated VGA based on SiS5596, 5597 or 5598 chipset, either a GVC FR-500, Biostar M5SIB or similar. Also had an ESS Solo or (if you were lucky) Yamaha 744 sound onboard. Stuffed into a pretty hefty full ATX midi tower. Usually paired with 17" shadow mask Tatung/Hyundai 0.28 dot pitch (not so amazing, but hey, if you buy Packard Bell wanting 'high end' you're asking for it ) with two Diamond speakers attached to the sides. It was bundled with a 17 inch CRT, keyboard and mouse and sold for 1999,- DM (1380€ / 1590$ by todays purchasing power). These Medion machines were very popular in Germany back then because their price/performance ratio was very hard to beat. So I would see this configuration somewhere between mid- and high-end. Some point the following year the family PC was upgraded from a local PC shop, not sure the cost but smaller budget. In late 1998/early 1999 for about $500 Canadian my family got a french-conversion packaged Packard Bell from the Radio Shack Outlet Store. We never applied the French conversion stickers, but it did mean all of the manuals were in french even if the software was ultimately English. I'd say that was a pretty low-end machine at the time, not that I was old enough to know better. So now I've definitely figured out that 448MB of RAM is probably a little too much, even for the high end. I really don't have much of a choice on what HDDs I can use, because I don't have anything smaller than 40GB, but it'll have to do for now. Thanks for the help, it makes wrapping my mind around these sorts of things quite a bit easier. I remember sticking with 128MB RAM until 2000 since games didnt need more than that, atleast in an optimized system. I would say 256MB for the high end limit. I bought a HDD in late 98, IBM Deskstar 14GXP. At 14.4GB it was the largest model, also one of the few 7200RPM models at that time. ATA-66 interface. As for CD-ROMs i think 40x was pretty much as fast as they went at that time. For high-end graphics, probably a voodoo3 3000 (March) or TNT2 Ultra (April). Yes, 448 MB of RAM for a normal PC in late 98 is indeed a bit too much, if you want to be "periodically correct". Most motherboard with sdram slots had max. 3 slots, some *might* had 4 slots (but I think those appeared after the Pentium III launch, in the spring of 1999). There were 128 MB modules, but they were quite expensive, so the max was 384 mb, but a more realistic build would be 3x64 mb. As far as I remember those were some typical "specs" back then. RaverX wrote: There were 128 MB modules, but they were quite expensive, so the max was 384 mb, but a more realistic build would be 3x64 mb. In that case, my 256MB module I have in there goes bye-bye. The thing is, as far as truly period correct RAM is concerned, I only have a 64MB and 128MB module, so I'll end up at 192MB of RAM. I do Have a 32MB module, but it's PC66 and the bus on that thing is PC100. I'm fine with putting PC133 in there and letting it underclock, but putting a 66mhz module in there and letting it overclock seems more risky. I currently have a Pentium III Katmai 500mhz in there, so I'm sorta forced to go with early '99 right now. If I had the money to get a PII400, I'd also be getting a new motherboard that has more features and expansion options than the one I currently have. If I were to really go for something, it'd be an Intel 440BX board with a Celeron 300A oc'd to 450Mhz or some stupid crazy number like that. I've seen an OC like that rival the highest-end Pentium IIs of the time. lost77 wrote: I bought a HDD in late 98, IBM Deskstar 14GXP. At 14.4GB it was the largest model, also one of the few 7200RPM models at that time. ATA-66 interface. When I can, I'm honestly considering getting some sort of PCI Ultra-Wide SCSI card and sticking a 10-20GB 10,000RPM HDD in it. For some reason, I've always really wanted a lower capacity 10,000RPM HDD. I am pretty sure that's overkill and that that would have cost enormous amounts of money in early '99, so a good large capacity Parallel ATA drive would suffice. Now that RAM amount is done, and I've got a good idea of the processors and storage, that makes things a lot easier. I noticed that there is almost zero mention of ZIP drives, if any at all. Were they just not practical at the time, or was it something people just didn't really care about by that point? I've always found ZIP drives really interesting but if nobody really found a true use for them back in the day, I could use the free 3.5" slot. If you are on a tight budget you might want to look for a TNT2 M64. Would be a good fit for a 500 MHz Katmai and ranges between TNT and TNT2 performance-wise. At least here in Germany there are plenty of these cards available on eBay for 6-7€, shipping included. My parents had a basic PC built by a cousins cousin, who was the IT guy at a local High School. If I remember the specs were mostly as follows. It was pretty low end, but was a great machine overall for being PC Chips based. Micro Atx case with ATX PSU, didn't used AT PSU. Wish I still had this machine! Tons of fun playing Unreal Gold and Half-Life and countless others. I kind of tried to map out the x86 PC specs for my years of active gaming, mostly based on the highest model released by the end of that calendar year. I don't know if it would be helpful for anyone. 98 and 99 were amazing years in gaming, we had so many awesome cards come out. I put down 9 in 98 and 10 in 99. It's just CPU, video, video bus, and OS but it's been helpful in searching. True. 1998 was one of the best year, Voodoo2 and Riva TNT were huge leaps in 3d graphics. Late 1996 to early 2000 was awesome, a true golden era. We went from under 200 MHz CPUs/16-32 MB RAM/1 MB 2D video cards to 1 GHz/256 MB/32MB 3D video. 1997 was the milestone: from AT to ATX, AGP, USB... from pixelated 2D games that ran slow in 320x200 to bilinear filtering in 640x480, such change was never seen since then, I imagine that something similar happened when we went from black and white monitors to color monitors. In 1998, I had an Aopen AX59 Pro motherboard with a K6-2 300MHz, 128MB RAM, Matrox Millennium G200 and a Creative 3D Blaster Voodoo 2. Some time in late '99, early 2000, I upgraded to a Aopen BP6 motherboard, Celeron 433A, 256MB RAM and a Creative 3D Blaster Annihilator Pro (GeForce 256 DDR). Norwegian PC's are generally above the average in spec, compared to many countries, but my budget wasn't high end, so I always focused on bang for the buck. I think these systems would be pretty representative for a "budget oriented gaming build" for the time periods. The problem with Zip drives was getting other people to buy them. Mostly people copied fairly small files (like documents) or CD-ROM sized data (like programs/games). So a floppy drive and a CD-R was enough. Instead of a Zip drive i bought some cheap removable 5.25-inch HDD enclosures and gave those to the people i often traded with. Motherboards of that era started having good BIOS auto-detecting for drives so it was very easy. From what I remember the low-end around this period were the Celerons (not the overclocking kind), K6-2s ~300 (not K6-3s) and Cyrix M2s. 32MB RAM was still common (RAM prices were still being gouged) at least until mid-2000 thanks to the dotcom bubble and increased availability of really lowend machines. My first Pentium was supposedly high end in 1997 according to the person I got it from, cost about 1200€ equivalent (not accounting any inflation).